^ "Free Trade Fallacy" New America. ^ a b "Second Bank of the United States" U-S-History.com. ^ "Republican Party Platform of 1856" presidency.ucsb.edu. ^ Pacific Railway Act (1862) ourdocuments.gov. ^ ANDREWS, E. Benjamin, Page 180 of Scribner's Magazine Volume 18 #1 (January–June 1896); "A History of the Last Quarter-Century". ^ Lind, Michael: "Lincoln and his successors in the Republican party of 1865–1932, by presiding over the industrialization of the United State, foreclosed the option that the United States would remain a rural society with an agrarian economy, as so many Jeffersonians had hoped." and "...Hamiltonian side... the Federalists; the National Republicans; the Whigs, the Republicans; the Progressives." — "Hamilton's Republic" Introduction pp. xiv–xv. Free Press, Simon & Schuster, USA: 1997. ISBN 0-684-83160-0. ^ Lind, Michael: "During the nineteenth century the dominant school of American political economy was the "American School" of developmental economic nationalism... The patron saint of the American School was Alexander Hamilton, whose Report on Manufactures (1791) had called for federal government activism in sponsoring infrastructure development and industrialization behind tariff walls that would keep out British manufactured goods... 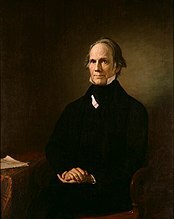 The American School, elaborated in the nineteenth century by economists like Henry Carey (who advised President Lincoln), inspired the "American System" of Henry Clay and the protectionist import-substitution policies of Lincoln and his successors in the Republican party well into the twentieth century." — "Hamilton's Republic" Part III "The American School of National Economy" pp. 229–30. Free Press, Simon & Schuster, USA: 1997. ISBN 0-684-83160-0. ^ a b Richardson, Heather Cox: "By 1865, the Republicans had developed a series of high tariffs and taxes that reflected the economic theories of Carey and Wayland and were designed to strengthen and benefit all parts of the American economy, raising the standard of living for everyone. As a Republican concluded... "Congress must shape its legislation as to incidentally aid all branches of industry, render the people prosperous, and enable them to pay taxes... for ordinary expenses of Government." — "The Greatest Nation of the Earth" Chapter 4, "Directing the Legislation of the Country to the Improvement of the Country: Tariff and Tax Legislation" pp. 136–37. President and Fellows of Harvard College, USA: 1997. ISBN 0-674-36213-6. 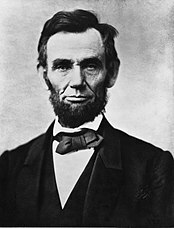 ^ a b Boritt, Gabor S: "Lincoln thus had the pleasure of signing into law much of the program he had worked for through the better part of his political life. And this, as Leornard P. Curry, the historian of the legislation has aptly written, amounted to a "blueprint for modern America." and "The man Lincoln selected for the sensitive position of Secretary of the Treasury, Salmon P. Chase, was an ex-Democrat, but of the moderate cariety on economics, one whom Joseph Dorfman could even describe as 'a good Hamiltonian, and a western progressive of the Lincoln stamp in everything from a tariff to a national bank.'" — "Lincoln and the Economics of the American Dream" Chapter 14, "The Whig in the White House" pp. 196–97. Memphis State University Press, USA: 1994. ISBN 0-87870-043-9. ^ Gill, William J. "By 1880 the United States of America had overtaken and surpassed England as industrial leader of the world." — "Trade Wars Against America: A History of United States Trade and Monetary Policy", Chapter 6, "America becomes Number 1" pp. 39–49. Praeger Publishers, USA: 1990. ISBN 0-275-93316-4. Lively, Robert A. "The American System, a Review Article," Business History Review, XXIX (March, 1955), 81–96. Recommended starting point. Party Platforms of Republican and Democratic Party's, including links to Third Party's in history. Vanguard of Expansion: Army Engineers in the Trans-Mississippi West, 1819-1879, by Frank N. Schubert, History Division, Office of the Chief of Engineers, August 1980.